I purchased some raspberry jam to make raspberry tartlets for Mike. I got all my ingredients out, dug out my mini muffin liners, and then tragedy struck. I couldn’t find my mini muffin pan. Noooooooooo!!!! I tore my kitchen apart – both the actual kitchen and our basement kitchen and they were nowhere to be found. I pouted about this for a couple weeks before deciding that I should just make something else with the jam. I decided to re-make an old recipe with a few changes. In a medium bowl, cream together butter and sugar until smooth. Stir in vanilla and gradually mix in flour until dough comes together. Roll dough into 1 inch balls and place on ungreased cookie sheets. 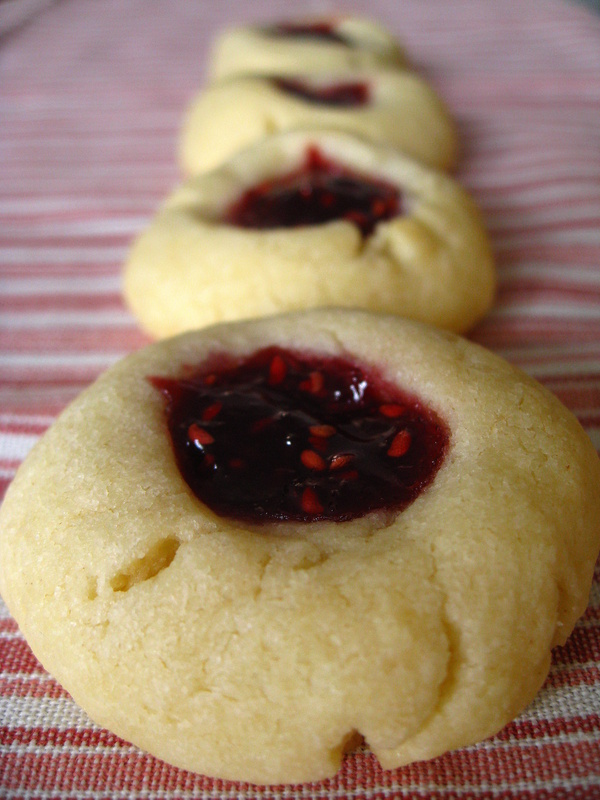 Make a small indentation in each ball with your finger and fill with 1/2 teaspoon of preserves. Bake for about 15 minutes or until edges are very lightly browned. Let cool on cookie sheets for 1 minute and move to wire rack to finish cooling. Categories: Cookies, Dessert | Tags: cookies, dessert | Permalink.